Laban agreed to let Jacob have Rachel in return of Jacob’s seven years of labor for him. After seven years had passed, Jacob asked Laban to let him marry Rachel. Laban didn’t keep his promise and give Leah to Jacob for marriage instead. Laban gives Leah Zilpah as her maidservant. When the morning comes, Jacob found out that the woman he married is Leah, Rachel’s older sister. So Jacob works for Laban another seven years so that he can marry Rachel. After the seven years had passed, Laban keeps his promise and let Jacob marry Rachel. 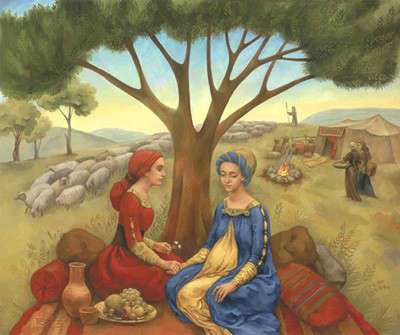 Laban gives Rachel Bilhah as her maidservant. The Lord saw that Jacob loved Rachel and Leah was not loved so he opened the womb of Leah. Leah become pregnant and gives birth to a son named Reuben. Leah also has other sons which are Simeon, Levi, and Judah and a daughter called Dinah. When Rachel saw that she is barren, she gives Jacob her maidservant Bilhah. Jacob lay with Bilhah and Bilhah bore him a son. Rachel named the bay boy Dan. Then Bilhah become pregnant again and gives birth to a second son whom Rachel named Naphtali. When Leah saw that she is not bearing anymore children for Jacob, she took her maid Zilpah and gave her to Jacob. Jacob lay with Zilpah and Zilpah became pregnant. Zilpah gave birth to a son called Gad. Zilpah became pregnant again and gives birth to Asher. One day, Leah’s son Reuben was in the field and he found some mandrakes and brought it to his mother. Rachel said to Leah, “Please give me some of the mandrakes.” Leah said, “I will give you the mandrakes in return for Jacob.” Rachel agreed and Leah went to hire Jacob to sleep with her that night. And so Leah became pregnant again and bore a fifth son. Leah named the boy Issachar. Leah became pregnant again and gave birth to a boy named Zebulun. Then God remembered Rachel and open Rachel’s womb. Rachel became pregnant and gave birth to a baby boy. Rachel named the baby boy Joseph.